Posted on April 2, 2012	by Katy K.
Young Fredle by Cynthia Voigt. Read by Wendy Carter. Fredle is a young mouse who lives behind the walls of the kitchen of a farm house, also inhabited by Mr. and Mrs., Baby, two dogs and a cat. He and his more adventurous girl cousin, Axel, enjoy pushing the boundaries of the strict mouse rules, talking while foraging and even foraging outside of the normal times. And then they find something new and delicious – a peppermint patty. They both eat themselves sick. Axel is able to run away to wait to get better, but Fredle is pushed out of the nest onto the pantry floor. From there, Mrs. takes him outside, presumed by all the mice to be a death sentence. Getting to this point of the story took long enough that I was surprised at how many discs were left of the audiobook – but this is really just the beginning. 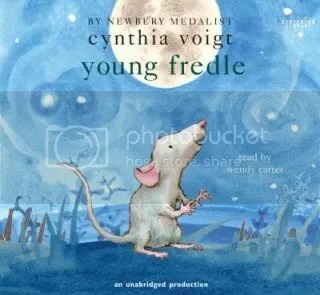 Fredle gets better, has an outside mouse bring him food, and discovers the stars and what he thinks are multiple moons. He must learn very quickly how to find food outside and how to stay safe from the outdoor cats as well as raptors, owls, snakes and racoons. Somehow, he makes friends with Sadie, the flightier of the two dogs, and develops an exploratory friendship with a young woodshed mouse who defies her colony’s rules against talking with house mice. He spends what seems like forever searching the perimeter of the house for a way back in, only to be kidnapped by a band of raccoons, the Rowdy Brothers. And when Fredle finally makes his way back home, he finds that he can no longer just go along with the rules that have always been followed, when he can see that doing things differently could save lives. Many of the Amazon reviews talked about how the message was the importance of Freedom. Which is a nice all-American message, but not really the message that I got out of the book. It is some about freedom, of course – but when Fredle was first dumped on the grass outside, he was perfectly free and absolutely in danger of his life, both from the illness and from not knowing his way around. I think the more important lesson that Fredle learned was about flexibility and adaptation. Rules are fine if they’re really helping to keep you alive and safe, but they need to be re-evaluated regularly to make sure they really are still the best way to do things. Unmentioned in those reviews, but going along with it, is Fredle’s learning to appreciate beauty, not just going through the day trying to find enough to eat and then sleeping the rest of the day away. Many Amazon reviewers also found it slow, and aside from the slowish though not uninteresting beginning that I mentioned earlier, we did not find this to be the case. I listen to audio books in the car with my son daily, and rarely does he complain about the suspense of just having to stop wherever we land when we get to school. This time, he was waiting anxiously to find out what would happen to Fredle, especially as we had to turn it off just as Fredle had been spotted by a snake. This was a runner-up for the annual ALA Odyssey awards for best audio for youth and teens. It was indeed very pleasant listening, though there are also illustrations in the print version that we didn’t see. This is a good choice for elementary-age kids and would make a good fine family read-aloud. This entry was posted in Uncategorized and tagged audio, youth fantasy, youth fiction. Bookmark the permalink.